Sometimes the smallest of things, even seemingly inconsequential and trivial happenings, later prove to be of singular importance. So it was in the life of Elder Henry Bennion Eyring, who on 1 April 1995 was sustained as the newest member of the Quorum of the Twelve Apostles. For Elder Eyring, the call to the apostleship represents a culmination of numerous “defining influences,” as he calls them. The first and certainly one of the more profound of those influences was his early family life. 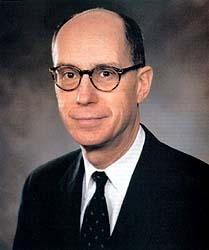 Henry B. Eyring, or “Hal” as he is known to family and friends, was born 31 May 1933, the second of three sons born to Henry Eyring and Mildred Bennion Eyring. At the time of Hal’s birth, his father was a professor of chemistry at Princeton University in New Jersey. Living on the eastern seaboard, the Eyrings were far away from the population center of the Church. Their small branch met in a hotel room. When World War II began and gas rationing restricted travel, the Eyring home became the meeting place for the Saints in Princeton. The dining room table served as both speaker’s rostrum and sacrament table. His mother was often both chorister and pianist. She would tap her foot as she played to help the people follow along with her. Elder Eyring smiles at the memory. He also remembers that he and his brothers, Harden R. and Edward M., constituted the total membership of the Aaronic Priesthood and were the only LDS youth in the branch as he grew up. The advice deeply impressed young Hal. He went on to finish his degree in physics, graduating not long after the end of the Korean War. During the war, the number of missionaries called from each ward had been greatly restricted. Further, by the time he graduated, Hal had already committed to a commission in the U.S. Air Force. So he entered the military without having served a full-time mission. But in a bishop’s blessing prior to his departure, Hal was promised that his military experience would be his mission. That blessing proved to be prophetic, for though Hal was originally sent by the Air Force to the Sandia National Laboratories near Albuquerque, New Mexico, for temporary schooling, circumstances were such that he stayed on there for the full two years of his duty. Two weeks after his arrival, he was called as a district missionary in the Western States Mission. He served almost two years to the day in that calling. With military service concluded, Henry Eyring determined to continue his education, but not in physics. He enrolled at the Harvard Graduate School of Business in Cambridge, Massachusetts, where he completed a master’s degree in business administration. As he finished that degree, his father’s advice proved to be pivotal. Trying to decide what field of business to enter, he realized there was no type of business that strongly attracted him. That’s when he knew it was the teaching of business﻿—actually helping others understand how to take a complex process and work it through﻿—that he thoroughly enjoyed. He stayed on at Harvard and completed a doctoral degree in business administration. Even before he had finished his dissertation, he was accepted as an assistant professor at the Stanford Graduate School of Business in Palo Alto, California. The decision to continue his studies at Harvard proved to be significant for another reason. It meant he was still in Boston during the summer of 1961, when Kathleen Johnson, daughter of J. Cyril and LaPrele Lindsay Johnson, of Palo Alto, California, came to Boston to attend summer school. Hal, who was serving as a counselor in the Boston district presidency at the time, was assigned to preside at a sunrise service for young adults. After that sunrise service, he saw a young woman coming out of a grove of trees. Not only was he struck by her beauty, but at that moment the words of President David O. McKay came to his mind: “If you meet a girl in whose presence you feel a desire … to do your best, … such a young woman is worthy of your love” (Gospel Ideals, Salt Lake City: Improvement Era, 1953, p. 459). “That was exactly how I felt as I saw Kathleen for the first time,” says Elder Eyring. The courtship continued throughout the rest of the summer and then by mail and phone after Kathleen returned to California. They were married in July 1962 in the Logan Temple by Elder Spencer W. Kimball. Kathy was to prove to be more than a good wife and mother. She was to be another of those defining influences in the life of Henry B. Eyring. The best example of that happened when Hal had been teaching at Stanford for about nine years. It was a richly satisfying time in their lives. He was given considerable freedom to design the classes he taught at Stanford. He returned for one year to Boston as the Sloan Visiting Faculty Fellow at the Massachusetts Institute of Technology. He had also entered the business world now, serving as an officer and director for Finnigan Instrument Corporation and becoming a founder and director of System Industries Incorporated, a computer manufacturing company. In the Church, he had taught early-morning seminary, served for a time in the bishopric of his own ward, and then was called as the bishop of the Stanford First Ward, a campus ward. When asked about that night, Kathy is not sure what it was that brought forth that question. “We were very happy there,” she agrees, “but somehow I just felt like there was something more important that he should be doing. I knew that his teaching at Stanford was wonderful, but I felt there was something he could teach that could truly change lives.” She knew about the Church Educational System (CES) and somehow remembered that Neal A. Maxwell was the commissioner. Thus her comment. It was enough. Hal determined he would pray about it. At first he got no answer, or so he thought. But it wasn’t long after that when the phone rang and Commissioner Maxwell, who apparently knew of Hal Eyring, was on the line asking if Hal could come to Salt Lake City. He went. Elder Eyring smiles at that. “You’ve got to remember, I grew up in the East, and I was living in California. I have to admit I didn’t even know where Ricks College was then. If you had asked me whether it was a two- or four-year college, I couldn’t have told you.” But a call of such importance was not treated lightly. Even before leaving Salt Lake, he began to pray about it. For a day or two, he could get no answer, which troubled him. “And then,” he says, “as I was praying, an impression came that simply said, ‘It’s my school.’” Realizing that was all the answer he needed, he returned to California, and he and Kathleen began making plans to leave Stanford. On 10 December 1971, Henry B. Eyring was inaugurated as president of Ricks College. Elder Eyring credits his father’s example. “My father spent time with us, even when laden with heavy and demanding responsibilities, because he loved to. I feel the same way. Organizing Saturday morning family work projects or painting elaborate watercolor illustrations for family home evening presentations are things I just love to do,” he admits with a chuckle. The Eyrings’ four sons﻿—Henry, Stuart, Matthew, and John﻿—are involved in business careers, and the three married sons have given their parents seven grandchildren thus far. The Eyrings’ oldest son, Henry, shared an experience that is especially tender to him. “I was in the mission field in Japan,” he recounts. “I went there with great confidence and high expectations.” But at the end of ten months, there had not been a single baptism. “I was really down,” Henry continues, “very discouraged. And then came a short letter from my dad.” In essence, all it said was that even though the people in Japan might reject him, God would never reject him and that Henry’s father was pleased with his son’s labors. Mary Kathleen, who is eleven, summarizes in two words what it is like to have Henry Eyring as a father. “It’s fun,” she says. She and her father often watercolor together, and they also bake bread for the family. Having heard reports that Elder Eyring sometimes cooks breakfast, the family was asked if, with the new demands on Elder Eyring’s time, that was still true. “He helped cook breakfast for me this morning,” Mary Kathleen answers. His presidency at Ricks brought Henry Eyring into close association with many General Authorities and other leaders of the Church. They liked what they saw. Henry was called as a regional representative and then as a member of the Sunday School General Board. After five years at Ricks, he was asked by Jeffrey R. Holland, who was then the commissioner of the Church Educational System, to serve as his deputy commissioner. Three years later, when Commissioner Holland was made president of Brigham Young University, Henry B. Eyring was asked to become the new CES commissioner. Coming to the Quorum of the Twelve at a time when the Church has more than nine million members spread across the world in more than 150 countries, Elder Eyring expresses gratitude for those defining influences of previous years. Yes, “defining influences” have helped shape the life of Elder Henry B. Eyring. Now, in his position as a member of the Quorum of the Twelve Apostles, he will have the opportunity to serve as a special witness of the Lord Jesus Christ. Recognizing that there is no greater “defining influence” than that which comes from the Father and his Only Begotten Son, Elder Eyring will help carry that testimony throughout the world. Gerald N. Lund serves as the ward teacher development director in the Mueller Park Seventh Ward, Bountiful Utah Mueller Park Stake. Above, left to right: Father, Henry Eyring; brothers Ted and Harden, young Hal; mother, Mildred Bennion Eyring. Left: Henry Eyring with his mother. Below: With his wife, Kathleen, at their wedding reception. Bottom: In a favorite role: teacher. A recent portrait of the Eyring family. Front row, left to right; Daughter Mary Kathleen, Elder and Sister Eyring, and Elizabeth. Back row, left to right: Sons John, Matthew, Stuart, and Henry.